In Year 1 we have daily focused 30 minute sessions in which we teach Phonics based on the Letters and Sounds scheme. We set across the Year Group which means that your child will be getting targeted phonics teaching at the appropriate Phase for him/her (2,3, 4 or 5). We have a strong focus on children being able to spell words using their phonics as well as reading them. Phonics sessions include many games and activities to practice spelling and writing and reading and recognition of phonemes. Children are encouraged to read real and nonsense words in order to use their knowledge of phonics to attempt to read unknown words. The pictures below show the phonemes that are covered throughout year one and the high frequency words that children need to know. Your child’s Teacher can let you know which phase your child is at. They will also highlight unknown phonemes termly in your child’s reading record book. In addition each week the children will bring home an activity to support the spelling of High Frequency Words. To help us structure sentences we use the Sentence Train both verbally and to support our writing. Each part of a sentence is represented by a colour coded train carriage. The children have been introduced to these train carriages from year R and are familiar with their use. 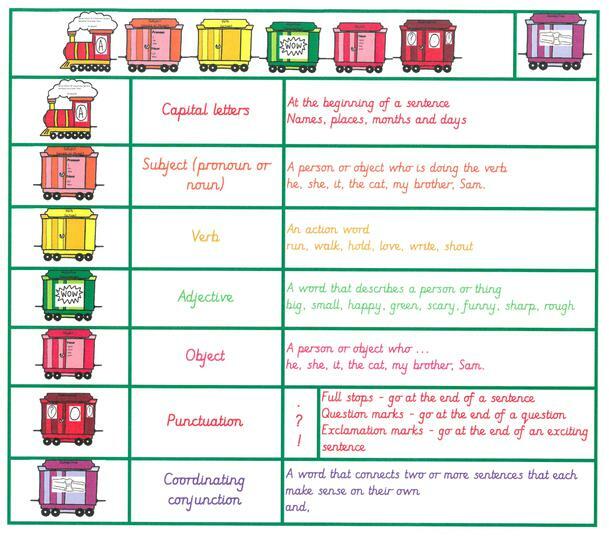 Children are encouraged to order sentences using the train carriages, highlight specific types of words in texts and use the trains as a visual prompt for Writing. Punctuation- full stops, capital letters, question marks, exclamation marks. The children will also be taught the difference between statements, questions and exclamations. Statements= a sentence that tells the reader information and ends with a full stop. Question= a sentence that asks the reader something. It starts with a question word and ends with a question mark. Exclamation= a sentence beginning with “how” or “what”. It includes a verb and ends with an exclamation mark. By the end of the year the expectation is that most children will be able to independently construct and record clearly grammatically correct sentences. 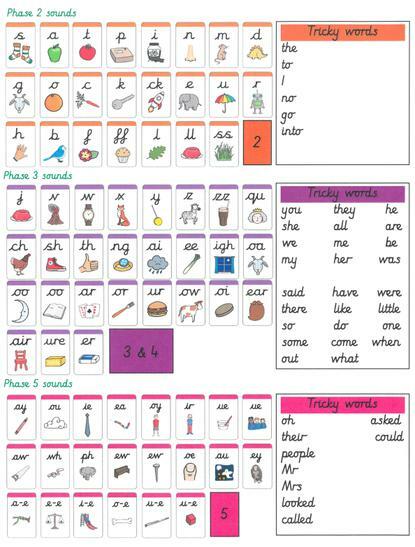 Some of them will be able to write extended sentences using simple connectives such as “and”. Children take part in guided reading sessions regularly in which they experience using their phonics skills to decode new words as well as recognising some words from sight. Children are encouraged to think about the text they have read and answer questions about the characters, plot and features of the text. Please ensure that you read your child’s school reading book with them regularly and talk about the text they read. They may like to see if they could predict the ending of the story or talk about alternative words that tha author could have used. The children can change their books when they are ready and will also take home a library book regularly to enjoy- this is usually a non-fiction book to ensure children have experience of reading a variety of genres. If you would like to know more about the expectations of the children in Reading and Writing please follow the links at the top of the website to access the “Herne Steps”. As well as practising their phonics skills through reading books, here is a list of useful websites that we use here in school. Enjoy!